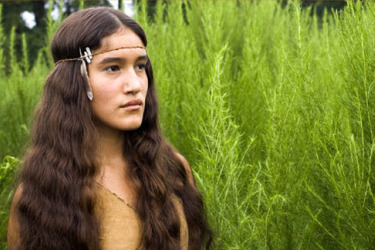 The New World recounts the story of Pocahontas (Q'orianka Kitcher), the 17th century native American princess of lore. Directed by Terrence Malick. You know the story well, Captain Newport (Christopher Plummer) lands on Virginia's shores in 1607 and with him is the infamous Captain Smith (Colin Farrell) who is eventually integrated into Pocahontas' tribe as being banished from Jamestown. The two become lovers and the rest they say is history. While there is no denying The New World is stunning visually and incorporates a natural vividness that is breathtaking, director Terrence Malick cannot seem to decide what he actually wants to tell us. There is not one iota of connection between Smith and Pocahontas (blame both actors) nor between Pocahontas and her second husband, John Rolfe (Christian Bale). Worse, Malick incorporates very little dialogue and opts to give us Shakespearean moments where characters prattle on to themselves - in their minds. It's a very tiresome experience and has this reviewer wishing the New World had never been discovered to save us from schlop like this.